UK menswear designer Tom Cridland has launched a unisex sweater that comes with a 30-year guarantee, to promote sustainable fashion. Cridland's aim was to create a durable piece of clothing that can "last a lifetime", in response to the increasing tendency towards throwaway fashion. "Working in the fashion industry, I became more and more familiar with the concept of built-in obsolescence – clothing brands making their garments to deliberately only last a certain length of time so that customers are forced to return and buy more," Cridland told Dezeen. "I think the concept is wasteful and unnecessary, especially for wardrobe staples like sweatshirts." Cridland started his eponymous menswear brand a year ago, and his chinos have since been worn by actors including Leonardo DiCaprio, Ben Stiller, Jeremy Piven and Daniel Craig. His latest project focuses on another wardrobe staple: the cotton crewneck sweatshirt. Available in five colours, the 30 Year Sweatshirt features reinforced sleeve seams, a ribbed trim and a discreet stitched logo on the left breast. The fabric is made from 80 per cent organic cotton and 20 per cent polyester, with a silicon treatment applied to the material to prevent shrinking. The designer worked with Portuguese craftsmen to create a high-quality fabric that is both durable and resistant to scuffs and tears. They use a traditional knitting technique to form loops on the backside of the sweatshirt's fabric – a style that's referred to as "loopback". 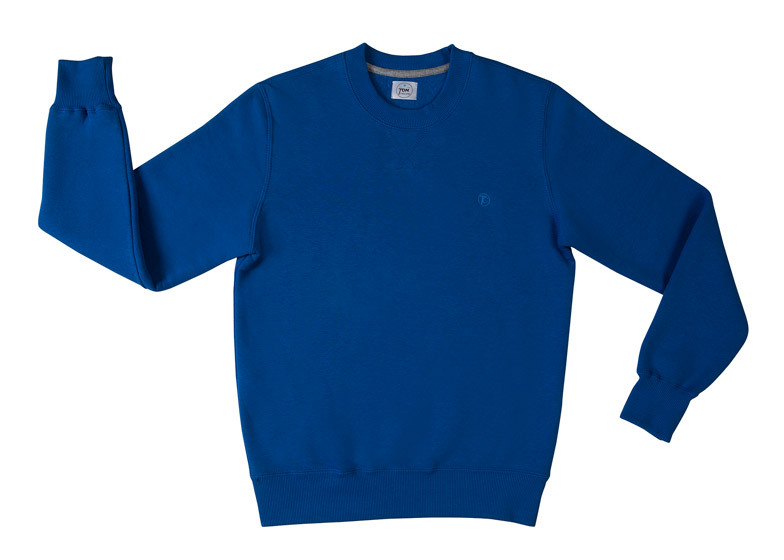 "We use three fine yarns of this loop-wheeled fabric to create material for our sweatshirts that will look better and better as it ages," said Cridland. As stated in the name, the garments come with a 30-year guarantee that allows the wearer to send off their sweatshirt for free repairs – to prevent them from throwing it away. "Should they, without meaning to, cause the sweatshirt to tear slightly we will fix it immediately and pay for the return postage," Cridland said. "In the unlikely event the elbow of the sweatshirt gets worn, we'll sew on a beautiful elbow patch that will only add to the look of the garment." Cridland launched The 30 Year Sweatshirt on crowdfunding platform Kickstarter, raising more than £5,500 of the project's £50,000 goal at the time of publishing – with 28 days of the campaign remaining.